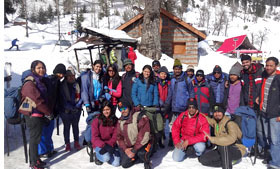 Apart from supporting a wide range of activities that serve the professional and intellectual interests of the students, the institute organizes various sightseeing, adventure and destination tours for students at Manali, Piridi , Goa, Kerala, Karnataka, Tamilnadu and many more places. During the study tours, student groups meet with local and multinational managers and government officials. They use the opportunity to observe local and multinational business operations and explore the variety of complex and multifaceted phenomena that define India . Additional opportunities for a more comprehensive understanding of India are established through visits to numerous historical, political and cultural sites, and through participants' own experiences of exploration and discovery during the visit.